In 1880 Ernst Abbe patented the orthoscopic eyepiece for use with microscopes. 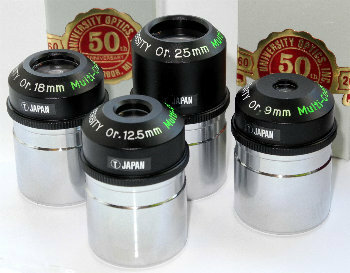 For many years these eyepieces were the acme of observing perfection and many older astronomers will swear by them. More recently the Plossl along with budget wide-field eyepieces have become the eyepiece of choice for most beginners and it seemed it was all over for the ortho now out of fashion with few manufacturers and little interest among the new generation of observers. Recently its been something of turnaround and a new generation of astronomers are finding something to shout about in the traditional Abbe orthoscopic.......So what's driving the recent comeback of this venerable design and just why are people getting excited ? Like many people who started astronomy in the 1970s my scopes were always equipped with less than perfect eyepieces. Ramsdens were very common along with Huygens eyepieces. Anyone with memories that far back will swear how bad some of these eyepieces were. Many looked like something out of a Christmas cracker and performed about the same. When I returned to the hobby I was amazed at the range of eyepieces now available to even a modest purse both in function and cost. Naturally, like many tyros I was seduced somewhat by the charms of big heavy eyepieces with their huge field of views. 70 degrees, 80 degrees and even 100' field of view eyepieces from a variety of manufacturers. Glossy adverts for budget wide-fields abounded and to the beginner the large packaging of these eyepieces made them look a bargain. What quickly became apparent to me was that all but a few of these wide-field eyepieces showed defects in either their sharpness or color with some having distinctly 'muddy' views while others produced lot of false color. What bothered me most was that the sharpness seemed to be missing in all but the most expensive eyepieces. Many beginners today start out with the humble Plossl supplied with their telescopes. Like the Orthoscopic the Plossl was once an expensive eyepiece technology and the preserve of the well heeled. Unlike the orthoscopic Plossls lend themselves to mass production and ever decreasing costs, and unfortunately, quality. Low cost Plossls today are infinitely better than the dreadful eyepieces of yore but very often there are very substandard ones in the market. Orthoscopics by contrast are produced almost exclusively by small Japanese companies who have their eye on quality. Orthoscopics are relatively inexpensive (at least compared to some eyepieces) but to many new comers they look expensive for such a small piece of glass. The secret of an orthoscopic is the polishing of the glass. A triplet lens arrangement must be polished and cemented in a perfect arrangement if the eyepiece is to perform well . Unfortunately this costs and there are only a few manufacturers who make the lenses and have sufficient precision of assembly. When coupled with small sales volumes the high precision induces a higher cost than a similar mass produced Plossl. Amazingly many of the orthoscopic eyepieces were made by very small companies. The much venerated Tani was in fact one elderly man who spent his life producing high quality eyepieces. These are the highly rated Circle T types. These were in production for 60 years until 2012 when Tani-san retired. Having tired of cheap wide-field eyepieces, and found high powered Plossls to have short eye relief and, to my discredit, having scorned the use of orthoscopics I found myself persuaded to the use of orthoscopics by an astronomer friend. I asked what she used for her amazing sketches and she told me she was using orthoscopics from University Optics. These were (since at the time of writing Tani-san has retired) one of the main outlets for the Circle T orthoscopics. Biting the bullet I decided to buy a pair of University Optics orthoscopics and see how I got on. Knowing that I found high powered Plossls to be almost useless because of their tight eye relief I opted for a pair in 9mm and 12mm. These were ordered from the US and they were shipped very quickly. Orthos also have a tight eyerelief but at lower powers are very comfortable. On arrival I was somewhat surprised at the quality and feel. In photographs they tend to look a bit plasticky but in the flesh they are quite weighty and solidly constructed and have a very much old world charm about them. 50 years on and still a great performer. I had been told that orthoscopics don't generally tend to work well in faster scopes so my first nights viewing was using my f15 Maksutov. The eyepieces performed very creditably and indeed I would say they were sharper than almost any other eyepiece in the scope. A later nights viewing using an f5 reflector actually amazed me. The views were so sharp that the only eyepiece that came close in contrast and sharpness was my 14mm Explore Scientific which is a very much more expensive eyepiece altogether. Subsequent tests showed I wasn't just seeing things and these relatively low cost orthoscopics really were that sharp. On the basis of the initial viewing I acquired an 18mm and 25mm for use with my Maksutov and also for use with my f10 achromat. In all of the scopes the eyepieces have performed superbly. A few months later I had the chance to acquire an almost full set of Baader Genuine Abbe Orthos (BGOs) which are priced slightly higher than the University Optics volcano topped Circle T's. Much has been written about the Baaders ability to work a little better with less scatter due to their phantom coatings. Testing like with like on focal lengths I found little difference. I suspect it may be possible to see a difference with perfect seeing conditions or maybe better eyesight just on the basis of other reviewers opinions. I could see no discernible difference on a range of targets. I did though the Baader GOs to be less comfortable to my eyes than the University Optics Volcano Top models. This is an endless debate with astronomers and to my mind a profitless argument. Use what you find comfortable is my opinion. Build quality for both the Baader and University Optics units were extremely good. Highly polished and weighty chromed barrels and although the eyepiece tops are plastic its a very high density and good quality with metal retaining rings and field stops inside and well blackened interiors. The Baaders have smoothside barrels whereas University Optics barrels have cut-outs. I would say the Baader GOs were of very slightly better construction and slightly heavier but either would be a good choice. In terms of value for money I consider the University Optics Orthos to be amazing value. As regards quality of the views, much has been written. I could give you a list of targets but its sufficient to say the best my f5 newt has ever performed outside of the hallowed eyepieces from Pentax, Televue and Explore Scientific has been with the University Optics and Baader Orthoscopics and I am not so sure that in terms of sharpness, contrast and color rendition that they are really second to much at all. Obviously like any orthoscopic they have a narrow field of view and, at shorter focal lengths, tight eye relief but, in terms of contrast, clarity and color rendition they can offer a performance which only the very best eyepieces can match. Not bad for an eyepiece that cost £55 (University Optics) or £75 (Baader Genuine Ortho). You would have to spend a lot more to get the same quality of view. My own collection of University Optics and Baader orthoscopics. On balance I prefer the University Optics Volcano Tops for comfort. And so there you are, an eyepiece that to many beginners often seems quaint and old fashioned has started to see a rise in popularity again as the new generation of observers finds that these eyepieces still have much to offer. Pin sharp views for an extremely attractive price. 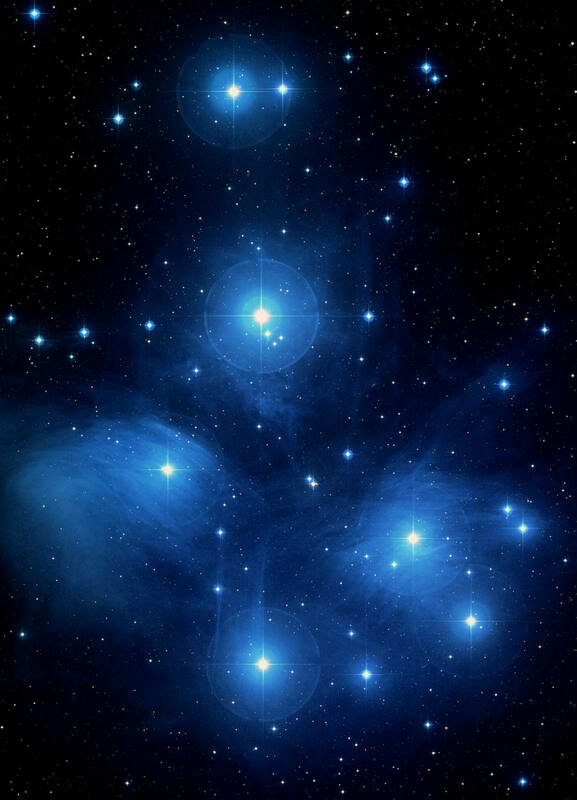 For planetary, lunar and double star work where field of view is not critical there is much that an orthoscopic can offer but they can do so much more than that with their superb sharpness on deep sky objects such as the Orion Nebula. Sadly as I wrote this article it transpired that many orthoscopics would no longer be available with the demise of some of the optical manufacturers in Japan. This has been attributed both to the venerable Tan-san retiring along with the Japanese Tsunami. Its sad that just as interest is being revived in these classic eyepieces suppliers who have been producing them for very many years ceased production. Baader are no longer producing the Genuine Ortho and University Optics also are now also unable to supply the classic Circle T Volcano Top. New manufacturers are entering the market however with Kasai restarting production of the HC series which are similar to the Baader Genuine Orthos but without the much vaunted Phantom Multi Coatings and Baader have released a budget Ortho series dubbed the BCO - so it may not be last orders yet for this classic eyepiece design.